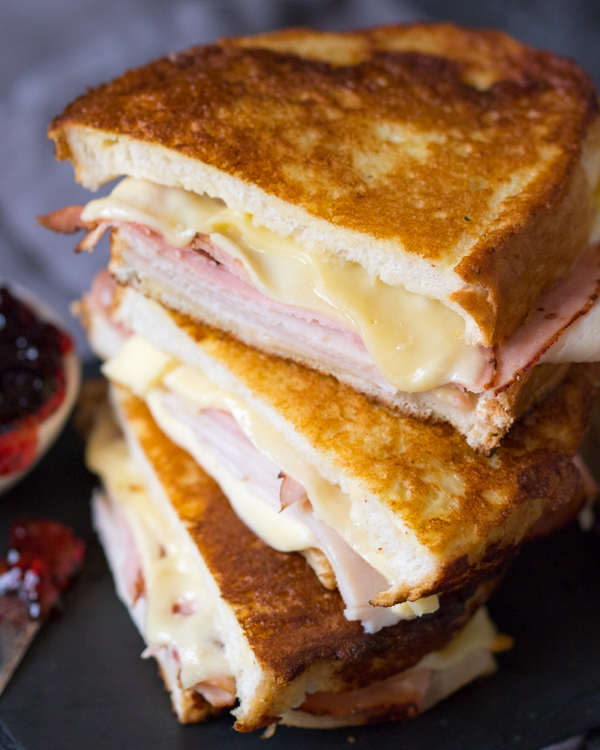 Turkey, ham and melty cheese, sandwiched together between golden slices of french toast. 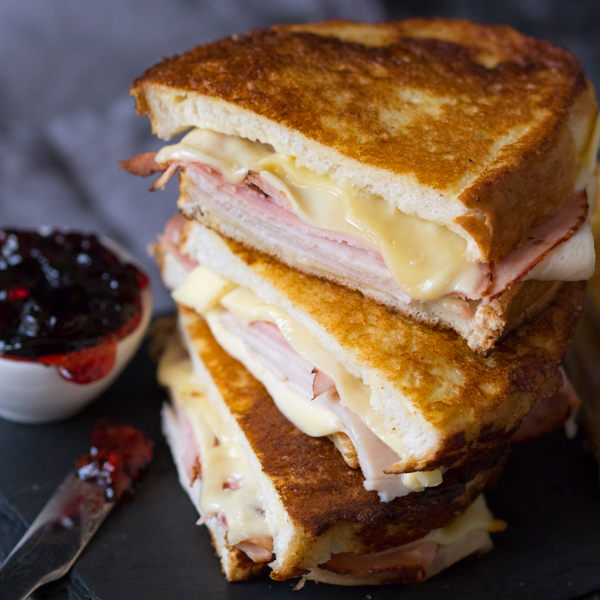 An American classic, the Monte Cristo Sandwich is believed by some to have been invented at the Monte Cristo Hotel in Everett in 1925. 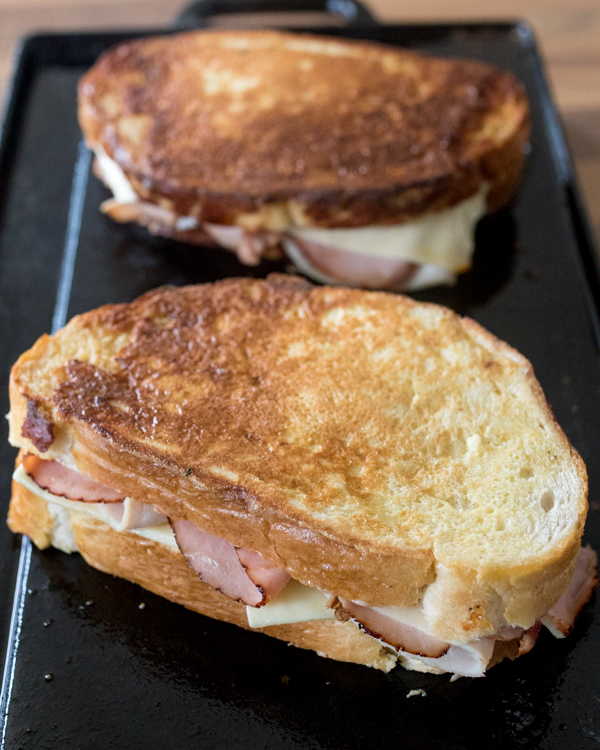 Sometimes made with ham, sometimes turkey, sometimes both, this sandwich is always filled with sliced cheese before being dipped in an eggy mixture and fried until golden brown. I think it’s important to use good-quality meat and cheese to ensure the best possible flavor. Serve it for brunch, lunch or a naughty evening snack. I like to serve mine with a little powdered sugar and a pot of red currant jelly for dipping. If you’re not keen on the jelly option, mustard also works great. However you serve it, this sandwich is a real treat! Place two slices of bread on a board and spread with one tsp of mayonnaise on each. 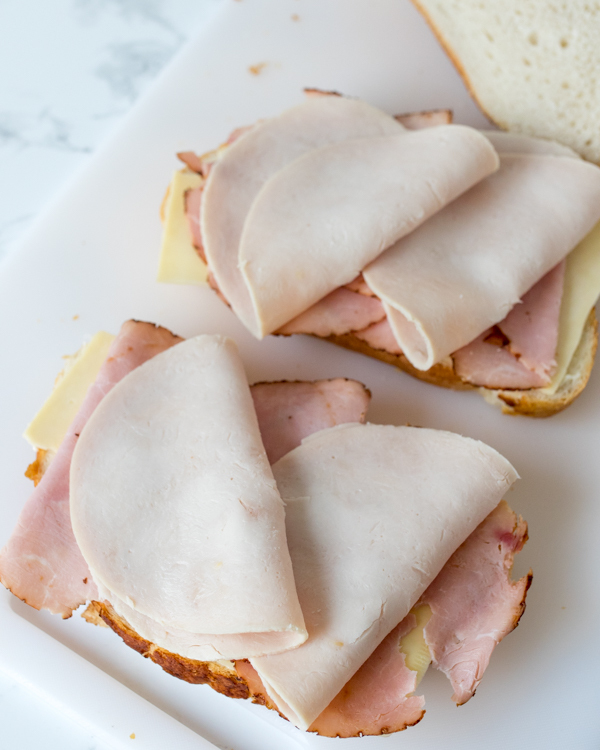 Layer each with two slices of cheese followed by two slices of ham and two slices of turkey. Top with the remaining slices of bread. Heat the butter and oil on a griddle or skillet. Mix the egg, milk, salt and pepper in a shallow dish. Dip both sides of each sandwich in the mixture and place on the griddle. Cook until golden brown (about 2-3 minutes), then turn over and cook until the cheese has started to melt and the the sandwich is nicely browned. Remove from the griddle and slice in half. Sprinkle on some powdered sugar and serve with redcurrant jelly.